Re: Why Can’t Programmers.. Program? After having read numerous articles on the inability of many CS graduates to program; in particularly “Why Can’t Programmers.. Program?“; I have decided to explain what seems to catch everyone by surprise, yet should be obvious. First, a little bit about me. I am currently a Upper Junior studying for a BS in Computer Science at Queens College. Then the exams come; in almost all my classes 50% have failing grades(<60/100), sometimes less due to the huge curves a lot of the professors give. Now if you are a Computer Science major and get something like a C (after tremendous curves) in a programming class, it is the same as getting an F. Sadly professors can't fail everybody or they would look like bad professors, so they implement these curves in order to have a decent number of students passing their class. After the finals and the course is over, at least half of GROUP F will pass, It has been the case in almost all my classes. (they claim they have passed with a C which is enough for the major requirement. All GROUP C and GROUP A will pass, with the minor difference that C people will receive a B+ or A-, whereas A people an A, or A+. Of course, there are professors that actually try to keep their precious field free of incompetent workers, but these are few. I have had the extreme cases where a professor actually let you cheat on an exam by letting you write down all the algorithms you need to know in a sheet of paper. At first I thought this guy was kidding but when i showed up for the final and saw everybody with such sheet of paper I realized he was not. To make things even better he even left the class for about 5 minutes during the mid-term and the final exam letting everybody do as they please. This particular class was concentrated on MIPS assembly language programming, which I feel gives a huge edge to programmers; since they get to understand what all their high level instructions actually do. Sadly, due to this professor very few people from that class of 20 will have learned that important lesson. However, it can’t all be blamed on the professors, for letting that F student pass his course. Professors can’t be blamed because, the biggest and simplest explanation to the matter lays not with Group F (they probably won’t ever apply for a CS job anyway), but with Group C and A. In group A there are actually very few people who are majoring in Computer Science because they enjoy the material. Most are in because of the money rewards after they get a job. Group C and A do all their assignments, they pass the finals, they get good grades. So what? These students get their grades and never program again. They do not enjoy programming, they do not look at other code besides the one in their projects and homework. Okay, even if they don’t find it fun they should do it. What happens when you learn a new word in a foreign language and don’t use it for a year? That’s right, you forget it. These people don’t program outside of their classes, and that’s how they forget everything they have learned by the time they get their degree. Very, very few people actually program outside of class and this is what matters. The more you program on your own, the more you get to like it, and the better you become at it. If they major in Computer Science and don’t have practice outside homework, might as well not have wasted their money on useless degrees. I have told this to many fellow students but only few seem to understand me, others think that this will come as work experience and ignore me. Obviously, since 1 out of 200 programmers can program well when they graduate, this is not only going on in my college. Students everywhere are making the same mistake, which at best is just keeping themselves to their homework, or worse, participating in academic dishonesty. Sooner or later, a Masters degree will be the minimum requirement to apply for the majority of jobs, then the madness of doing CS for money perhaps will stop. These people should head elsewhere, if they are in CS for the money, and not because they really enjoy it. Ever since Microsoft’s Vista was announced I was not too excited about it. I could not understand what all the hype was about even after seeing all their promised great features. Today that Vista is available for purchase and everything about the new OS is known; I’m not only not excited about it, but definitely know that I won’t buy it. Microsoft Vista seems to have gotten it’s name right. “Vista” in spanish means “View” which would explain Microsoft’s new OS fully. It is nothing but Windows XP with a few new programs installed and a lot of graphics. Now there may be people out there willing to spend such money on the new OS just for the new graphics, but personally, most of the people I know that use computers in a regular basis tend to keep their desktop as simple as possible. My desktop is just a plain black background. Uhm, who wants a video as background anyway? Even worse, after seeing all the new “capabilities”, I am forced to conclude that Vista was made for people with little knowledge about computers. The kind of people who come to me asking me to fix their computer because a lot of Spyware has consumed it. People who will get their computer fixed and break it next day because they go to fishy web sites and get a new virus immediatly. Vista is made for these kind of people, since the control Microsoft has over systems with Vista on them is unbeliavable. So if you know how the basics on keeping your computer safe (updated anti-virus and firewall), i suggest you think about it a lot before deciding to buy Vista. Read the BBC article I’ve linked and you will be convinced. By the way, have I mentioned that all the new capabilities you will pay for in Vista are available for free as programs for XP from different sources? Don’t buy Vista! XP (or Mac OS) all the way. Remember when the first laptop came out? How much was it? A lot is the quick and simple answer. Sadly in many countries today, the price of a laptop is still as crazy as it was in the US when they first came out, if not more. Recently someone I know flew to the US from a developing country just to buy a laptop, as buying it here plus the plane ticket costs was still cheaper than buying it there. Luckily, for many developing countries this could change soon. 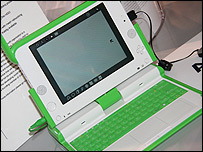 A cheap laptop is being developed in order to be shipped to children in developing countries. The specs on this laptop are still unknown but at least the looks of it aren’t that bad. At $100 this laptop will be much more affordable for all those countries (although probably still a luxury for a lot of those families), so a buy one sponsor one program is also in development. This will let US buyers acquire the cheap laptop for their own kids and sponsor a child in a developing country. For $100 it is a good deal as you very well know you do not want to let your child use your top of the line Toshiba Satellite or SONY Vaio. About a month ago I found out about a “country” which I have never heard of before. The Principality of Sealand, a fort in the middle of the sea which was setup in 1967 by Paddy Roy Bates. Since then this little country whose area is no more than 550 meters squared, has declared a flag, currency and more. Today this country has been declared for sale. They expect eight figure offers for a country which supposedly offers complete privacy and of course is a tax haven. Now who would want to buy such a country? Ah but of course, all the Hollywood celebrities which are trying to get away from all the papparazies, however, does any of them have such money? Anyway, they should just put it on eBay and it will sell, everything sells on eBay. Ha! !